Since it’s almost time for my basting tutorial as part of my Modern Trees Quilt Along, I thought I would share one of my favorite tools that makes the job easier – a Kwik Klip. These puppies have been around for awhile but I finally started using one after tearing up my fingers from previous basting attempts. A Kwik Klip is a simple wooden rod with a metal end with grooves in it. One of the grooves holds the end of the pin in place, so you can bring the head of the pin down to fasten it. When I first tried it out, I did it wrong. I kept trying to use the tool to push up the pin to meet the head. But that is wrong – don’t do that! Instead, hold the Kwik Klip in one hand and push the pin down to close with the other hand. I’m right handed so I held the Kwik Klip in my left hand and pushed the safety pin with my right hand. Do what feels most comfortable. Once I got the hang of it, basting went pretty quick. I put in a bunch of pins first and then closed them all at the end. Just so you know, I used to use Pinmoors for basting with straight pins. Those are small silicon caps that go on the end of straight pins. They are nice because you can remove them quickly while sewing. However, I timed myself and realized it takes longer to put the pins in and add the caps than it does to push in a bunch of safety pins and close them. After basting several quilts, I prefer regular safety pins with a Kwik Klip. 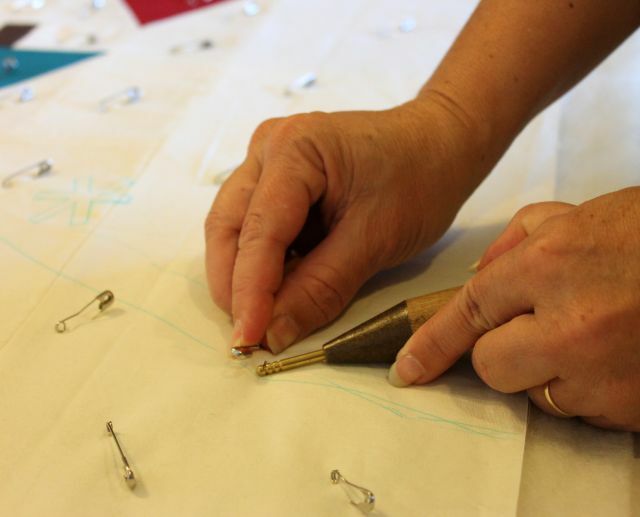 And honestly, while quilting, it’s not a big deal to take a second or two to remove a pin. I’d rather save time on the basting end of it rather than during the pin removal process. Blogger’s Quilt Festival (Fall 2013) Begins This Week! I bought the Kwik Klip and couldn’t figure out why everyone loved it. After seeing your tutorial, I wasn’t it correctly. Thanks for explaining it so clearly. I’m glad – that’s exactly how I felt for years until I finally learned to do it right 🙂 Next on my agenda is to try the pin covers! Thank you for the Kwik Tip! I needed this tip last week :). I put 400+ safety pins in a queen sized quilt sandwich. I probably overdid it, but wanted to be on the safe side since some other quilts have had folds in the back side when I quilted them. The day after that pinning I pinned a smaller blanket with just 150 pins. My fingers were raw! I am getting this tool. Thanks!!! LOL, I’d rather make really big basting stitches! Well, really, I’d rather have a longarm again, but that’s a couple of years away. Hi: I did a discussion on the Kwik Klip and pins. I use the covers for the pins also because it just plain is easier to hold and push through multiple layers. Please see my blog at http://www.sewgoldenachance.blogspot.com/2013/09/favorite-notion.html if you are interested. Kwik Klip is one of the best tools I have! I got mine a few years back as a christmas present from my daughter! Its time saving and easy on the fingers. One of my favorite tools ever. I always leave my pins open after removing them from the quilt. Another time saver when getting ready to pin the next quilt! I use this tool for basting and I find it the best. I will also thread baste when I hand quilt. The pins are easy to close and easy to remove. So nice to learn more ways to make quilting easier. Thanks for this. It is on my list to get the next time I see it in a store. Thanks for the recommendation. I always like to know that things really work before I buy them. I now need something else to help me sew!! I will check these out and see if they are easy to get in England. Basting is mt least favourite part of making a quilt. Kwik Klip is one of my favorite tools, too! With tendinitis in my wrists, my grip is weak for grasping pins and a lot of things. 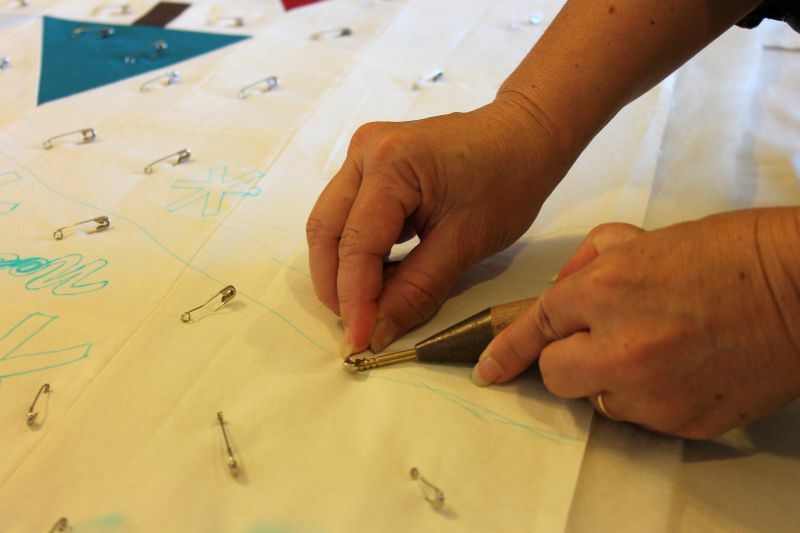 The Klip helps me leverage the pins in and up through all the layers. I will pin a row or two, then go back and quickly clip the pins closed along that whole row. And I know it might be a safety issue with small kiddoes in the house, but when I remove the pins as I quilt, I leave them open and drop them into my container…no need to open the pins again, the next time I need to baste a quilt. That saves my fingertips, too. I also use the Kwik Klip to help me open and remove the pins while quilting, since it’s hard to move the quilt in cramped quarters to reach in underneath my small domestic Bernina arm. Amen sister….preach it! I learned to use this tool just this summer, and have never looked back. Not sure why it took so long for me to take the plunge, but I would highly recommend it for all pin basters. Wow, I keep learning about new tools. This one looks great. I always use safety pins and this looks like it could make a huge difference! Thanks! I agree, Christa. 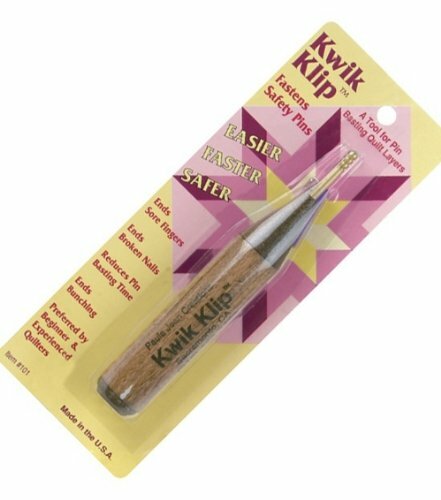 Kwik Klip is great for pin-basting my quilts for hand-quilting. My fingers don’t get sore. It was one of the tools I bought when I first started quilting a decade ago.